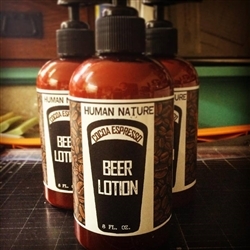 Beer lotion! 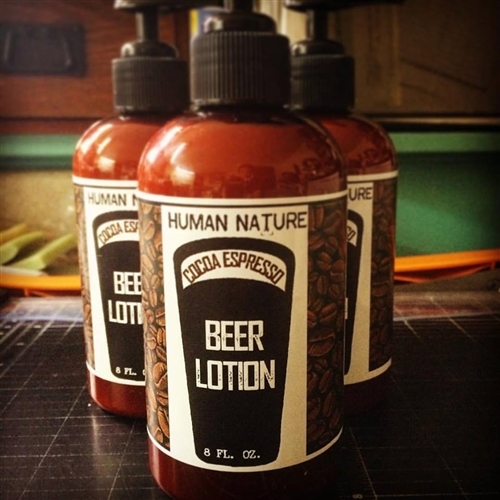 The combination of beer, cocoa and coffee is great for the skin. We have taken these ingredients and created a lotion that aids elasticity while providing antioxidants to keep your skin healthy, soft and moisturized. Contains: Distilled Water, Stearic Acid, Cetearyl Alcohol (and) Polysorbate 60 (and) PEG-150 Stearate (and) Steareth-20, Beer, Theobroma cacao (Cocoa) Seed Butter, Glycerin, Butyrospermum parkii (Shea Butter), Coffea arabica Seed Oil (and) Hydrogenated Vegetable Oil, Simmondsia Chinensis (Jojoba Seed) Oil, Prunus Amygdalus Dulcis (Sweet Almond) Oil, Cannabis Sativa (Hemp Seed) Oil, Caprylic/Capric Triglyceride (Coconut Oil), Aloe Vera Liquid, Zea mays (Corn) Starch, Tocopherol, Phenoxyethanol (and) Caprylyl Glycol (preservative), Citric Acid.